Produced in an exclusive 250-piece limited edition, the latest version of the Breitling Chronoliner B04 combines the blue of the dial and the ceramic bezel with the warm tones of the 18k red gold case. 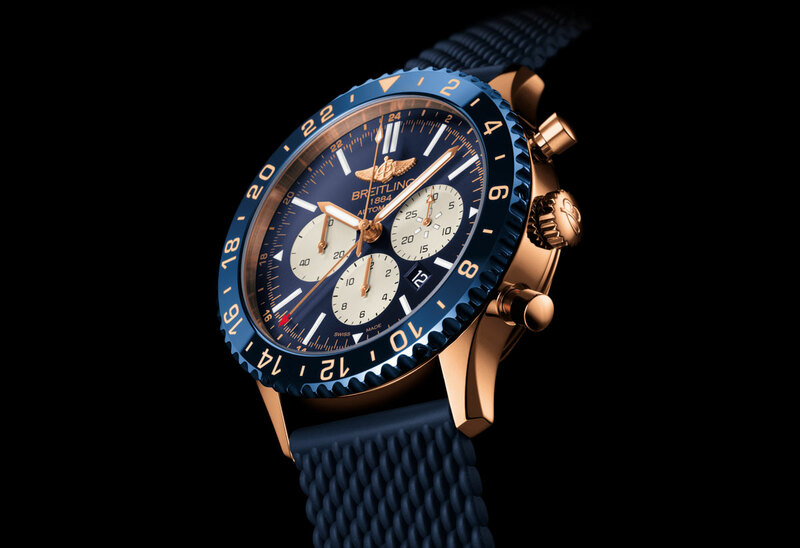 Water-resistant to 100 metres / 330 feet, the 46 mm case houses the manufacture Breitling Calibre B04, officially certified as a chronometer by the COSC. Beating at 28,800 vibrations per hour, it offers more than 70 hours of power reserve. The main hours hand is adjusted to local time by simply pulling out the crown and turning it either way in one-hour increments – without losing any precision in terms of the minutes and automatically adjusting the date in either direction. 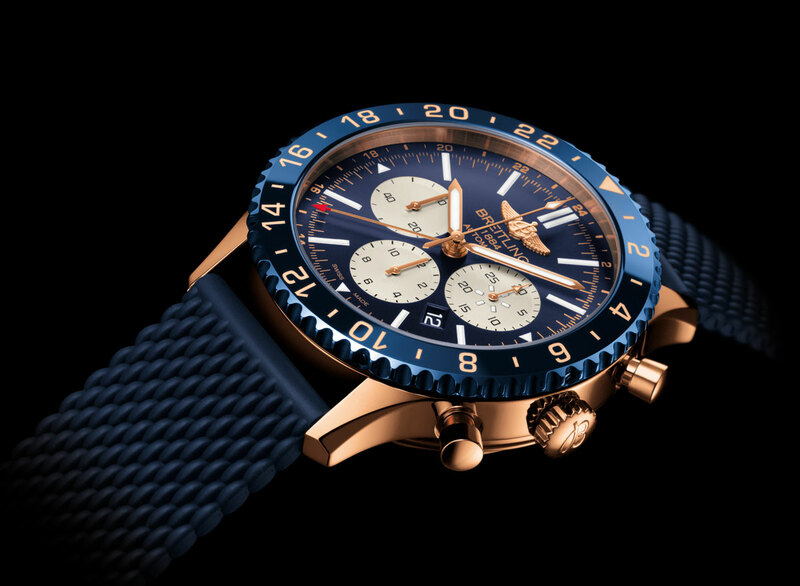 Perfectly legible, the white counters are chronograph 30-minute at 3 o’clock, chronograph 12-hour at 6 o’clock and continuous seconds at 9 o’clock. The red-tipped hand keeps track of home time in 24-hour mode, so allowing the owner to distinguish between day and night. The scratch-resistant ceramic rotating bezel displays a third timezone, also in 24-hour mode. Love the contrast between gold and blue. The watch looks pretty heavy, tough. Breitling Chronoliner B04. 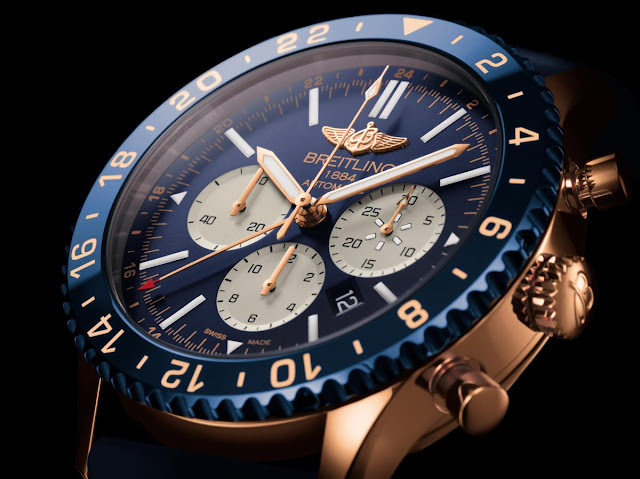 Produced in an exclusive 250-piece limited edition, the latest version of the Breitling Chronoliner B04 combines the blue of the dial and the ceramic bezel with the warm tones of the 18k red gold case. 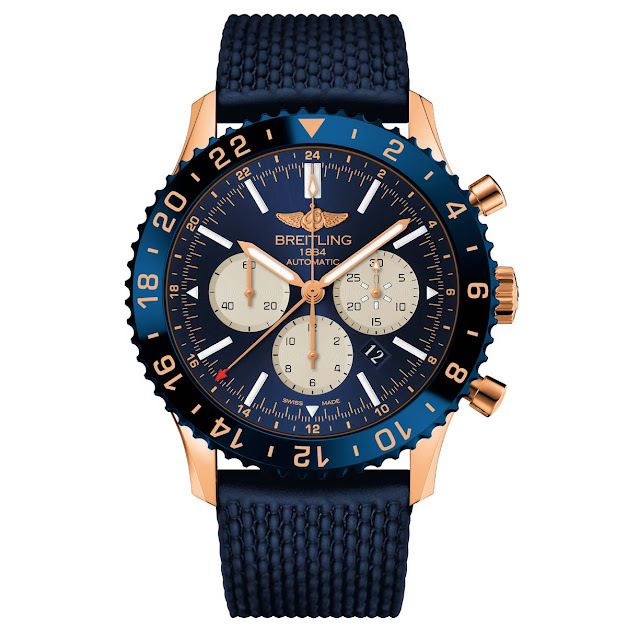 Completed by a blue rubber strap, the new Breitling Chronoliner B04 in red gold has a price of Euro 31,470.